Ice and Ruin: Who Is Lord of Heaven? Who Is Lord of Heaven? I've only ever had one decent idea for a computer game, or at least only one that captured my imagination enough to actually contemplate getting into game design and programming for about a week. Unfortunately, the idea is complex, and I don't have the patience or dedication to build up my abilities over the next 5-10 years before I could even attempt something like it. The idea is this: it's a massively-multiplayer combination of a real-time strategy game and top-down RPG. On one level, you have maybe 5-10 players managing kingdoms: building fortifications and public works, levying taxes, attracting peasant farmers, invading each other, fighting off monsters, etc. On another level, you have a multiplayer action RPG like Diablo or something. The catch is that in order to get anything military done, the kingdom-managers need to hire the RPG players. Goblin infestation on a remote farm? Hire a band of adventurers to clean them out. Dragon terrorizing the countryside? Attract some high-level players to track it back to its lair and slay it. Want to conquer the nearby kingdom? Better hope you can attract more skilled combatants than your neighbor can. The kingdom-managers could hire RPG players as one-off freelancers or permanent retainers to foster loyalty, and reward them with titles, keeps, and even conquered land to manage as vassals. I envision it creating a complex and shifting web of feudal politics, diplomacy, and backstabbing, leading to some emergent narratives of heroism, loyalty, and betrayal. I like the idea. But building a complex strategy game and role-playing game on top of a multiplayer network that can handle maybe a hundred players in a shared, persistent open world? Yikes. That's part of what I like about pen and paper games - it's much easier to implement new ideas, and the results can often be more complex than even big-budget electronic games. You could run something like this as a traditional RPG. In fact, I've seen a few examples of it. The catalyst for this post was Adam Koebel's Far Verona, a Stars Without Number campaign he's streaming on Twitch. Stars Without Number has a fairly complex system for managing dynamic setting politics called the "Faction Turn." Kevin Crawford presents this as something the DM does alone, but Koebel has turned the factions in his campaign over to his Patreon community. Supporters join a faction and vote on its actions each week, and then he determines the outcomes. I've only actually watched a little bit because it's a dull spectator sport (probably more interesting if you're actually a faction member) and I find Koebel and his players annoying. Still, it's a good idea. Zak Sabbath had also already tried something like this a few years ago for his Vornheim campaign, implementing his own homebrew strategic wargame in the background. The shear number of factions seems exhausting, and he said as much to me at some point. I don't think I'd do something like this with my regular D&D campaign for the same reason: too much going on already. 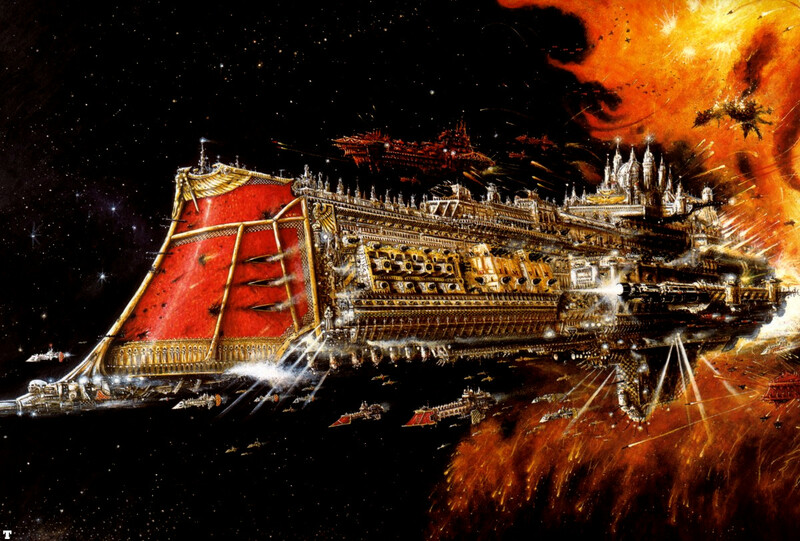 The idea of doing this with a space opera-style campaign appeals to me, though. One level of the game would be diplomacy and war between maybe 3-5 interstellar powers. I don't think I'd use the actual Stars Without Number faction rules. They seem far too complex for my tastes. I'd probably create something much closer to the actual Diplomacy rules with some random events added. To gain an edge, though, players in the diplomacy game would have to hire players from the RPG level of the game to complete missions for them: find a powerful artifact, gather intelligence, assassinate a general, sabotage an installation, etc. This would work much better if there were multiple parties to hire with their own specialties and loyalties, but that would be too much work for just me. If I could find a few other DMs to run the game, maybe, but that could get too unwieldy unless everyone was really reliable. So, this is percolating in the back of my mind. I think I'm calling it Lord of Heaven. Time to start creating the setting and factions and see where this leads. "probably more interesting if you're actually a faction member"
Only marginally - as a former Patron/member of the PRISM faction it ultimately couldn't hold my interest. I vastly preferred Koebel's previous SWN campaign. But I remember Zak's posts and the overall idea is intriguing, so I'm interested to see where you go with this.